Audio-Technica ATH-DSR9BT review: A digital future for high-end headphones? In the ATH-DSR9BT, Audio-Technica has created a unique and often wonderful headphone proposition. These over-ears are supremely comfortable for long listening sessions, while the behind-the-scenes proprietary technology is, in many senses, unrivalled for its delivery of ultimate clarity at the top-end. There are design niggles, however, while the neutral low-end and sharp high-end won't please all. How can audio progress in today's market? With digital streaming, the proliferation of Hi-Res Audio slowly making inroads, and the advancement of wireless technologies, there's increasing demand for quality. Audio-Technica's answer is the ATH-DSR9BT: the first over-ear headphones to ditch the digital-to-analogue (DAC) conversion process and deliver a true digital signal from source to drivers. The company calls it Pure Digital Drive technology. Which sounds all well and good, but what does this actually mean? Without a DAC there's no analogue conversion and, so the theory goes, no added distortion for more accurate reproduction. No conversion means no compromise of the original recording. Add aptX HD compatibility and it's possible to benefit from formats up to 48kHz/24-bit over a wireless connection for the utmost quality. With this digital focus, the DSR9BT ditches the 3.5mm headphone jack. Apple ditched the headphones jack in its iPhones, so Audio-Technica has done the equal opposite at the receiving end for the benefit of digital quality. If you must go wired then it's via the Micro-USB port only (to a Hi-Res-capable 96kHz/24-bit). We first saw the DSR9BT when announced in Japan back in 2016, then again at their soft-launch at CES 2017 in the USA, before living with a pair in the UK at the tail-end of that year for over six months, arriving at this juncture, with a full and rounded view of just how good these headphones can be... and, sometimes, just how limited. Audio-Technica likes to stress that each of its new products is built from the ground up, the same being true for the DSR9BT. Externally, however, these cans take some design inspiration from the earlier MSR7 model - a wired set of over-ears that we've long praised for balanced delivery, comfortable wear and a well-considered price point. The DSR9BT don't come with such a sensible price point, though. Not by a long shot. At £499 they're asserting the position of top-spec, no compromise cans for future-facing audiophiles. Which is a niche market - but if you're looking for such particulars then Audio-Technica certainly delivers the goods. It's not so much the exterior that you're paying for here either. Sure, the understated grey has appeal and there's nothing bad about the build - yet they're not exactly at B&O BeoPlay or Master & Dynamic levels of build quality or material selections. Everything A-T has a more plasticky sheen and simplicity about it. Where the real money is at, of course, is internally - which we'll get to in a moment - with world-first proprietary voice coils and all the goods that make for distinct audio. To take full advantage of their typically wireless nature, the DSR9BT host on-headphone controls too, positioned on both earcups. A jog-switch for volume adjustment sits next to a touch-sensor to start/stop or accept calls on the left earcup. On the other is the Bluetooth on/off switch, accompanied by a subtle in-ear chime to let you know they're active. All these controls are easy to locate without looking like you have lost something and equally easy to use with success. Their plasticky finish doesn't look or feel premium, however, with a finish that ultimately lacks cohesion with the rest of the headphones' material choices. Metal buttons might be an excess, but at this price point the material choice ought to be better matched. There's nothing to criticise about the quality of the earcups though. The light grey leather-like finish is well padded for optimum comfort, complete with threaded finish, while their depth avoids them pinching or pressing against the ears too heavily. Even the all-too-apparent spelled-out "left" and "right" markings of the earlier MSR7 have been moved to the insides of the DSR9BT, which looks much tidier. These are cushy cans indeed, thus ideal for long periods of listening with no qualms whatsoever. With a predominantly wireless focus, it's good to see that Audio-Technica has crammed in the majority of support that you'll want from such a pair of headphones. With Qualcomm's aptX HD supported, you'll get one of the highest-quality wireless streams you possibly can, at 48kHz/24-bit. Ideal if you have the relevant quality files. It's also worth pointing out that Sony can go one better with LDAC, the company's wireless format capable of supporting 96kHz/24-bit wireless via Bluetooth. Problem is, despite that being supported by Android Oreo 8.0 (thus meaning your Android phone could, theoretically, be compatible), you won't find that technology outside of Sony headphones. So it's hard to criticise Audio-Technica for not having this competitor's proprietary technology. Because there are tiers of quality standards, the DSR9BT also feature a trio of LED on the side of one earcup. One represents aptX HD quality, the other aptX (standard), the last AAC and SBC. It's a subtle way of visually showing the quality of incoming audio. Saying that, it's not especially clear how this system works without knowing about it in advance - and who reads a manual? If you do want to receive the top-of-the-line 96kHz/24-bit quality with the ATH-DSR9BT then you'll need to go wired. But there's a problem: you'll need to use the Micro-USB port, which is tucked beneath a flap next to the volume switch. The design of this port is, frankly, terrible. The flap gets in the way for wires and it's so sunken that few-to-no cables can fit in there successfully - if you lose the provided one you'll be tearing your hair out trying to find a usable replacement (we went through about seven different options and none fitted, other than the provided cable). Furthermore the Micro-USB connection takes a staggering five hours to charge when these cans are out of juice - which is too slow for forward-thinking headphones that want to be used wirelessly much of the time. We've often run out of juice in stand-by mode (we're not convinced there's 1000 hours of stand-by time, but the 15-hours of listening time rings true) and been left with no connection and therefore no music, having largely been dependent on Bluetooth connectivity from laptop or phone. In short: this USB port should be a weather-sealed USB Type-C, positioned to accept a wider range of cables, and without the unnecessary rubberised flap design. The comfort of the DSR9BT is great and connectivity throughout testing has been good, too. We did find a bug when switching between Android phone Bluetooth and Mac laptop Bluetooth, however, which caused a "crash" that required a hard reset to resume operation (even the engineers in Japan couldn't reproduce this one when we raised it as a possible issue). But what the DSR9BT is all about is audio. Forget any design niggles. Forget the price. You're going to buy these for wireless Hi-Res Audio quality, which is exactly what you'll get. The very first time we tried the DSR9BT in a near-silent room the experience was different to anything we'd listened to over the previous year. The amount of dedication to the top-end opens out a clarity that few can compete. We'll admit, at first we found it over-sharp, but then we realised it's really how much muddier competitor headphones sound with their drowning-in-bass balance by compare. With so much available clarity in the high end you'll really want those high-quality files, too, as the top-end is where you'll really begin to spot the unwanted compression and "fizz" of lesser audio. We've been listening with an Astel & Kern player to ensure top-spec listening, alongside our slightly lesser day-to-day phone- and laptop-based sessions. Now, if you do want bags of bass then you might find the DSR9BT too flat for your tastes. But then you'd probably say the same of a studio monitor. It's because that's how neutral sound is supposed to be delivered. With proper positioning on the ears and listening in the right kind of environment - these are hardly London Tube commuter cans, after all - there's great clarity. Personally we'd boost the bass via a separate equaliser, but that's a matter of taste - and there's no limitation on the DSR9BT being capable of delivering, as its 5-to-45,000Hz frequency response attests. 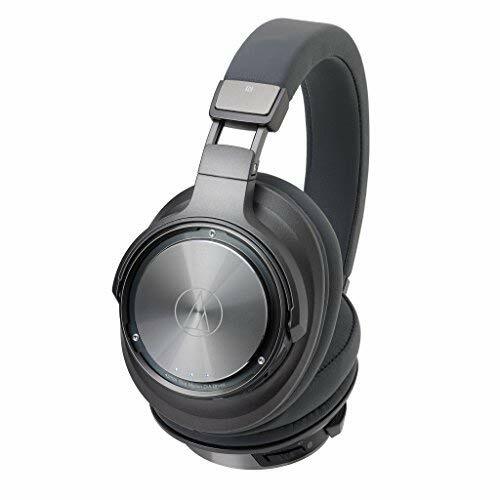 Unlike other headphones the DSR9BT include what Audio-Technica calls a "Dnote chipset", which commands four voice coils in the headphones' 45mm drivers. Most headphones only have one such coil, thus the DSR9BT can create a more dynamic response for a truer interpretation of a given recording. We dabbled in the known classics, such as Hotel California, which shows the power of a quality recording. Winding the clock forward to the modern era with a slice of Adele's latest album showed how well the DSR9BT can handle reverb-dripping vocals. Classical music sounds dreamy, while more compressed rock tracks sound like crushing walls of sound - and not always in a good way, so your preferred era and genre of music will help guide whether these headphones will suit your tastes. In the ATH-DSR9BT, Audio-Technica has created a unique and often wonderful headphone proposition. These over-ears are supremely comfortable for long listening sessions, while the behind-the-scenes proprietary technology is, in many senses, unrivalled for its delivery of ultimate clarity. Having used the DSR9BT for many months and tried many other headphones before and since, we've often been left wanting more of that ultra-clear top end that's delivered so very well here. That's what the A-T cans do that others cannot. However, perfection isn't quite achieved. The finish is far from class-leading at this price point, the Micro-USB port design is terrible, while the soundscape will lack bass and be over-sharp for some listeners. Overall, however, if you seek a digital wireless future from your high-end headphones then you've come to the right place. The DSR9BT is a niche proposition, sure, but a dream match for the right kind of listener with a collection of high-end music files.